Zeolite membranes have uniform and nano-sized pores, and they separate molecules based on differences in the molecules size and diffusion properties. Different routes used to prepare zeolite composite membranes include growing zeolite layers from gels on porous supports. Our approach to membrane synthesis was based on hydrothermally converting films of layered aluminosilicates into zeolite films. In this research, synthesis of nano NaA zeolite membrane from kaolin was investigated. In the first step, kaolin has been calcined at 700 °C to the metakaolinite phase. As a second step, the zeolitisation experiments have been carried out under hydrothermal conditions. The metakaolinite obtained has been reacted with NaOH solutions in autoclaves at 100°C. X-ray diffraction (XRD) patterns of the membranes exhibited peaks corresponding to the support and the zeolite. The morphology of the support and membrane subjected to crystallization was characterized by Scanning electron microscopy (SEM). 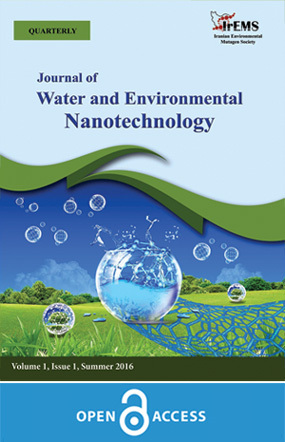 Separation performance of the NaA membranes was evaluated using pervaporation of water–Ethanol mixtures. The membranes showed high water selectivity in the water–Ethanol mixtures. Zeolites are a family of hydrated alumina silicate minerals that contain alkali and alkaline earth metals. Zeolite molecular sieves are crystalline porous alumina silicate minerals whose unique pore and channel systems in the molecular size range are the basis of their important contribution in catalysis, separation and ion exchange. Zeolites are porous three dimensional alumina silicates formed by the sharing of oxygen atoms in the framework aluminum and silicon tetrahedral. In recent years, attempts to develop zeolite membranes for separation and catalytic applications have been intensified considering their molecular sieving properties, uniform nano pore size, high thermal resistance, chemical inertness, and high mechanical strength. The investigation of nano zeolite membranes with nano pore size has attracted much attention. Zeolites are conventionally synthesized from sodium alumina silicate gel prepared from pure chemicals in air ovens or auto claves [1-3]. Using of the natural raw materials for the production of zeolites has economical advantageous comparing the synthetic chemicals. The kaolin mineral with a Si/Al ratio 1 has conveniently been used as a raw material for the synthesis of low silica zeolites. Since the uses of zeolites in several branches of industry have been increasing, the production of zeolites by economical ways has gained great importance in material science. Zeolite NaA membrane were reported to be excellent materials for solvent dehydration by Pervaporation (PV). The pore size of NaA zeolite is 0.4 nm, i.e., smaller than that of the MFI zeolite (0.55 nm). The small pore size of NaA zeolite makes the separation of small molecules by difference in size possible. Thus small molecules, such as H2O (0.27 nm), are expected to be separated from ethanol by molecular sieving or configuration diffusion using NaA zeolite membranes [4-6]. In this paper, preparation method of the Nano pore NaA zeolite membranes using by kaolin on mullite support is reported. Performances of the membranes prepared by hydrothermal in situ crystallization were studied in separation of the water–Ethanol mixtures by PV. The hydrophilic membranes used in this research were composite zeolite NaA membranes. The membranes were made of an active NaA layer, deposited on a ceramic porous mullite support. The active NaA layer is responsible for high separation factors achieved in PV of Ethanol mixtures. The structure of zeolite NaA is shown in Fig. 1. As shown in Fig. 1, the aluminosilicate framework of zeolite NaA is generated by placing truncated octahedrons (b-cage) at eight corners of a cube and each edge of the cube is formed by joining two b-cages by a D4R linkage. Each b-cage encloses a cavity with a free diameter of 0.66 nm and each unit cell encloses a larger cavity (a-cage) enclosing a free diameter of 1.14 nm. There are two interconnecting, three-dimensional channels in zeolite NaA: (i) connected a-cages, 1.14 nm in diameter, separated by 0.42 nm apertures, (ii) b-cages, alternating with a-cages separated by 0.22 nm apertures. Thus, molecules smaller than 0.42 nm in diameter can diffuse easily through the nanopores of the zeolite. In addition, position of sodium ions in unit cells is important since these ions act as the sites for water sorption and transport through the membrane. For a typical zeolite, a unit cell having the composition Na12Al12Si12O48.27H2O, eight (out of 12) sodium ions are located inside an a-cage and four ions are located in b-cages. Transport of solvent species (mainly water) through the zeolite matrix comprises of three steps: (i) strong adsorption of the species into a cage from feed side, (ii) surface diffusion of the species from cage to cage and (iii) vaporization of the species to permeate side. Normally, any physical adsorption process includes both Vander Waals dispersion-repulsion forces and electrostatic forces comprising of polarization, dipole and quadrupole interactions. However, since the zeolites have an ionic structure, the electrostatic forces become very large in adsorption of polar molecules like H2O. This effect is manifested in the fact that heat of adsorption of water into zeolitic adsorbents is unusually high (25–30 kcal/mole) . (ii) Hydrothermal reaction of metakaolinite with various aqueous alkalis medium. The activation process results in structural changes of the starting materials to promote their reactivity in the reactant solution for the direct transformation into zeolite from the constituent components . In ceramic membranes, thin dense layers are usually deposited over porous supports. The porous supports provide mechanical strength for the thin selective layers. Porous supports can be made from alumina, cordierite, mullite, silica, spinel, zirconia, other refractory oxides and various oxide mixtures, carbon, sintered metals and silicon carbide. Kaolin (SL-KAD grade) has been supplied by WBB cooperation, England. Analysis of the kaolin is listed in Table 1. Cylindrical shaped (tubular) bodies (ID: 10 mm, OD: 14 mm and L: 15 cm) have been conveniently made by extruding a mixture of about 75-67% kaolin and 25-33% distilled water. Suitable calcinations temperatures and periods are those at which kaolin converts to mullite and free silica. Good results have been achieved by calcining for about 3 h at temperatures of about 1250[10-13]. Free silica has been removed from the calcined bodies after leaching by strong alkali solutions. Removal of the silica causes mesoporous tubular supports to be made with very high porosity. Free silica removal has been carried out using aqueous solutions containing 20% by weight NaOH at a temperature of 80 °C for 5 h. Supports have been rinsed using a lot of hot distilled water for a long time in order to remove the all remaining NaOH. Porosity of the supports before leaching is 24.3%, while after treatment it increases to 49%. Flux of the supports before and after free silica removal at 1 bar and 20 °C is 6 kg/m2h and 10 kg/m2h, respectively. Porosity of the supports has been measured by water absorption method. The zeolites NaA synthesized by two different Routes. The synthesis from chemical source and kaolin source. Adding seed crystals to this crystallization system has resulted in increased crystallization rate. The enhanced rate might be due to simply increasing the rate at which solute is integrated into the solid phase from solution due to the increased available surface area, but also might be the result of enhanced nucleation of new crystals. The secondary nucleation mechanism referred to as initial breeding results from microcrystalline dust being washed off seed crystal surfaces in a new synthesis batch. These microcrystalline fragments grow to observable sizes, and result in greatly enhanced crystallization rates due to the significantly increased crystal surface area compared to the unseeded system. Consequently, it is to be expected that addition of seed crystals to a synthesis system will introduce sub-micron sized crystallites into the system that will serve as nuclei. Porous mullite tubes as describe above have been used as supports. External surface of the supports have been polished with 600 grit-sand papers and then they have been washed and cleaned in boiling distilled water for 5 min to remove loose particles created during polishing. Then, the supports have been dried at 100 °C for 3h in air. In order to coat a thin and uniform zeolite membrane layer over the mullite support, nucleation seeds should be small and uniform in size. To inhibit formation of the zeolites into the support pores, the seeds should not be too small to penetrate into the pores. High purity nucleation seeds (2 µm in size) have been synthesized by hydrothermal method. The seeds should be dispersed homogeneously over the support surface and the amount of seeds should not be too much. Otherwise, the synthesized zeolite membrane layer becomes heterogeneous or too thick. The seeded supports have been prepared by soaking the mullite supports in an 8% NaA zeolite suspension once for 1 min. The 8% NaA zeolite suspension has been prepared by mixing 8 g NaA zeolite in 92 ml distilled water. After soaking, the supports have been dried at 100 °C for 3 h in air. The synthesis solution has been prepared by mixing aluminates and silicate solutions. 4.87 g of sodium hydroxide has been dissolved in 76 ml of distilled water. The solution has been divided into two equal volumes and kept in polypropylene bottles. Aluminates solution has been prepared by adding 6.23 g sodium aluminates (Aldrich, 50-56% Al2O3) to one part of the NaOH solution. It has been well mixed until cleared. Silicate solution has been prepared by adding 16.57 g sodium silicate solution (Merck, 25-28% SiO2) to another part of the NaOH solution. Silicate solution has then been poured into aluminates solution and well mixed until a thick homogenized gel has been formed. Composition of the homogeneous solution for zeolite NaA membrane is represented by the following molar ratio 1.926 SiO2: Al2O3: 3.165 Na2O: 128 H2O [14-16]. Two ends of the support have been closed with rubber caps to avoid any precipitation of zeolite crystals on the internal surface of the support during membrane synthesis. The seeded support has been placed vertically in a Teflon autoclave. The solution has been carefully poured in the autoclave and then the autoclave has been sealed. The crystallization has been carried out in an oven at a temperature of 100 °C for 3 h. Then, the sample has been taken and the synthesized membranes have been washed several times with distilled water. The pH of the washings solution must be 7. Then, the samples have been dried in air at room temperature for 12 h.
NaA membrane was grown hydrothermally on the surface of a porous tubular mullite support (14 mm outer diameter, 12 cm length) using by kaolin powder as a source for aluminates and silicate. The hydrothermal synthesis of NaA zeolite membrane was performed as follows. In the first step shown in Scheme 2, crystalline kaolin is converted to amorphous, but chemically reactive metakaolin by dehydroxylation process at high temperature under air. In the next two steps, hydrothermal synthesis of zeolite A from both raw and purified kaolin have been conducted. Step 2 in Scheme 2 consists of the gel formation parameters including NaOH concentration, temperature In addition, time of aging. Finally, step 3 involves the hydrothermal synthesis. The final solids are washed and dried overnight before characterization. Synthesis solution was prepared by mixing metakaolin and NaOH solutions. NaOH was dissolved in distilled water. The solution gel was prepared by adding metakaolin powder to NaOH solution. The resulting mixture was stirred vigorously, producing a homogeneous gel. The molar composition of the resulting gel was SiO2/ Al2O3=1.926, Na2O/ Al2O3=3.165 and H2O/ Al2O3= 128. Two ends of the supports were closed with rubber caps to avoid any precipitation of the zeolite crystals on internal surface of the supports during membrane synthesis. The seeded support was placed vertically in a Teflon autoclave. The solution was carefully poured in the autoclave and then the autoclave was sealed [17-19]. After hydrothermal treatment at 100°C for 3 h, the sample was taken and the synthesized membrane was washed several times with distilled water. The sample was then dried at room temperature for 12 h in air. Fig. 2. Flow diagram for the studies parameters in the hydrothermal synthesis of Zeolite A from kaolin. We used a PV experimental set up to be sure of successfully fabrication Nano pore NaA zeolite membranes from chemical source and kaolin source. PV tests were carried out using a standard PV apparatus. The experiments have been carried out at a temperature of 30 °C and a pressure of 1.5 mbara at the permeate side, within a period of 30-60 min. Where and are weight fractions of water and organic compound, respectively. The NaA zeolite membranes were synthesized by chemical source and kaolin source. The mullite support was preparated from kaolin for zeolite membranes. The seeded supports have been prepared by soaking the mullite supports in a NaA zeolite suspension. The hydrothermally synthesis was used for preparation of zeolite membranes from chemical source. NaA membrane was grown hydrothermally on the surface of support using by kaolin powder as a source for aluminates and silicate. The synthesis of NaA zeolite from the kaolin source consists of two steps. At first, Thermal activation of the kaolinite in order to get metakaolinite. Then , Hydrothermal reaction of metakaolinite with aqueous NaOH medium. The NaA membrane is highly selective for permeating water preferentially with the high permeation flux be-cause of the micropore filling of water in the zeolite pores and/or the intercrystalline pores between zeolite crystals to afford water-selective permeation through the membrane. The performance of NaA zeolite membrane is the most favorable one among PV membranes that have been published so far and is very high enough to put these membranes into industrial applications. Phase identification was performed by XRD (Philips PW1710, Philips Co., Netherlands) with CuKα radiation. In addition, morphological studies were performed using SEM (JEM-1200 or JEM-5600LV equipped with an Oxford ISIS-300 X-ray disperse spectroscopy, EDS). Fig. 4 (a, b, c) shows the XRD patterns of the membrane support before and after sodium hydroxide treatment, respectively. The XRD pattern shows that kaolin after calcinations at 1250 °C for 3 h is converted into mullite and free silica. Free silica can be observed in crystalline and amorphous form as shown in Fig. 4 a. In primary support (Fig. 4 a), the XRD pattern is very noisy because of the amorphous phase. After treatment by sodium hydroxide, the noisy base is completely omitted (Fig. 4 b) and intensity of mullite peaks increases. This shows that silicahas been removed from the support. Removal of this free silica causes the support porosity to increase from 24.3% to 49%. By increasing the leaching time, all free silica has been removed as shown in the Fig. 4 c. Fig. 4c is XRD pattern of the seeded support after treatment. As seen, only mullite and zeolite (seed) can be observed. The XRD patterns of NaA zeolite membranes (preparation by chemical source) confirm that crystal of zeolite NaA has been formed. Fig. 5 shows XRD of the membranes synthesized using the above-mentioned methods. In this figure, the only phases, which can be observed, are zeolite NaA and mullite. The results show that repeating zeolite NaA formation procedure on the same support by the hydrothermal method improves membrane quality. Zeolite NaA membrane thickness increases with increasing the number of coating processes. However increasing preparation time of zeolite NaA membrane for more than 3 h causes other forms of zeolite such as sodalite and NaX to be formed. It must be mentioned that membrane flux decreases with increasing membrane thickness. In addition, significant changes in separation factor can be observed as shown in Table 2. Table 2 summarizes some details of the synthesis conditions and separation performance of the NaA zeolite membranes prepared in this work. A promising result has been obtained after five times of coating as shown in Table 2. Fig. 6 shows XRD pattern of formation NaA zeolite membrane and mullite support from kaolin clay. The XRD pattern of NaA zeolite membrane confirms that zeolite NaA crystals were formed from kaolin clay. Morphology of the support and the membrane made by kaolin was examined by Scanning Electron Microscopy. Fig. 7 shows SEM photographs of the mullite support surface.